We are Toronto-based theatre artists who create and perform fresh, exciting new plays. Our first show, The Little Prince: Reimagined was performed in Sudbury, Ontario and Toronto, Ontario in the winter of 2019. A crashed pilot. A mysterious boy. A timeless adventure. Puzzle Piece’s reimagining of the classic story features a gorgeous new staging and puppetry concept, and a modernized English text by Puzzle Piece Artistic Director Richard Lam. Come and experience the magic of The Little Prince like you’ve never seen it before. If you’re interested in booking The Little Prince: Reimagined, send us an email. We’d love to hear from you. For cast and creative information, click here. 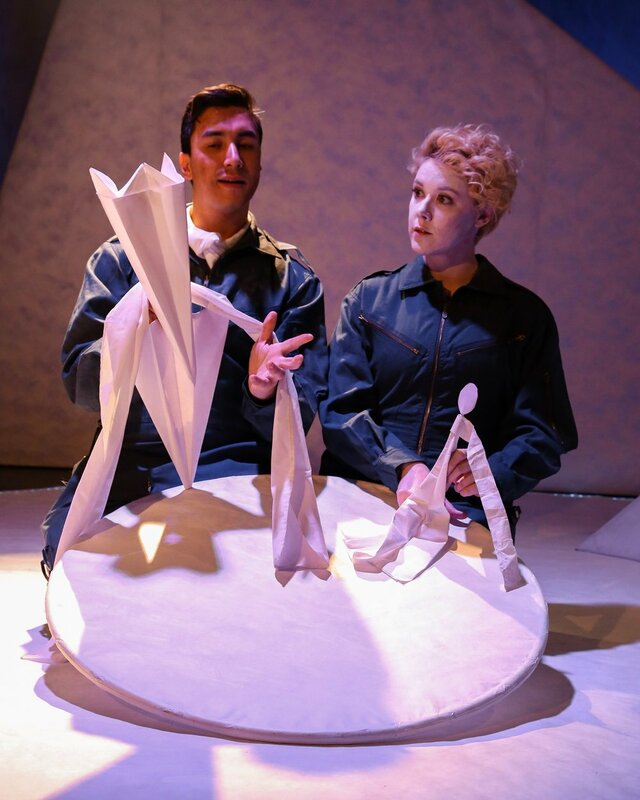 "Puzzle Piece’s magical take on Antoine de Saint-Exupéry’s classic never panders to young audience members...it takes immense skill to create and sustain this charming world." “"...the whole production is infused with a childlike sense of imagination and creativity...as the story says, “taming” is a stand-in for “loving” something and it’s clear this production is Lam’s “taming” of The Little Prince." Richard Lam is a Toronto-based Actor, Writer, Musician, and Sound Designer. Originally from Vancouver, Richard obtained his B.A. in Political Science at UBC before training in the BFA in Acting program at the University of Alberta. Richard was a company member at Soulpepper Theatre for four years, where he appeared in 15 stage productions, and joined the company on tours to the Charlottetown Festival and New York City. He has also worked for many other theatres across Canada, including the Citadel Theatre, Coal Mine Theatre, Buddies In Bad Times, Outside The March, YES! Theatre, and Concrete Theatre. Richard is the writer and composer of the original musical From Here, and is currently composing a still-untitled musical for YES! Theatre with Landon Doak and Matthew Heiti. The Little Prince: Reimagined is his first full-length play. Crystal Lee is a recent graduate from the Production Design and Technical Arts Program at the National Theatre School of Canada. Her interest in technical theatre and management began in her home province of New Brunswick where she worked as an Education and Outreach Coordinator at the Fredericton Playhouse and as a Theatre Production Mentor at the University of New Brunswick. She then continued her training with the Opera Management Program at the Banff Centre for the Arts in 2015. Crystal has spent the last couple of seasons at Canada’s National Arts Centre on the management team for big-house festivals (Canada 150 & Canada Scene 2017) and most recently assisted the NAC Production Department in their multi-million dollar renewal project of their national stages. On top of her duties as Managing Director of Puzzle Piece, Crystal is also a Toronto-based freelance Production Manager, working with independent companies including Obsidian Theatre, Paradigm Productions, and Tangled Art + Disability Gallery.